Months ago, when I was invited to speak in Leipzig on Kristallnacht, the invitation filled me with joy. What could be more wonderful? The city where my father was arrested and sent to Dachau has invited me back as its guest to speak at the city’s three separate Kristallnacht commemorations. And yet the changes that have occurred since I accepted the invitation six months have tempered my joy with concern. Anti-Semitism is rising sharply around the world. The aftermath of the Holocaust gave us a respite. Now, the world seems to be going back to business as usual. Questions about the legitimacy of the Jewish state—not this policy or that–-but her very right to exist as a Jewish nation don’t come just from radical Arab capitals. They come from England, France,Belgium, Holland, Scandinavia and even here in Germany now and then. Anti-Semitic attacks on Jewish institutions hardly make the general news any more, but they are becoming more common. In Europe anti-Semitic violence is such a pervasive threat that if you wish to visit a synagogue, you had best have a reservation in advance or the locked and guarded building is likely to be off limits. How should we respond to such existential concerns? Yes, we live in troubled times. Israel is besieged from every corner of the world, and Anti-Semitism is sprouting anew even at times here in Germany where it is forbidden by law. Are we to succumb to despair? 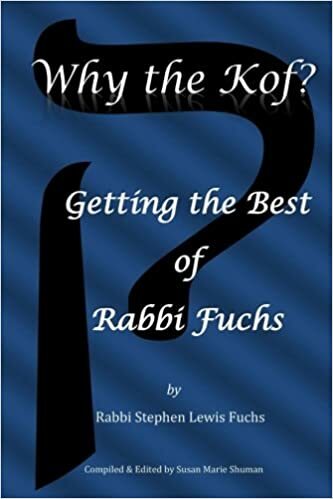 No, as the Rabbi of Apt advised, our task is to find joy, wherever we can and do our very best to live up to God’s hopes for us, and trust that if we do, God will see us through the perils in our path as God promised Abraham so long ago. This summer, Israel’s long period of quiet exploded into a horrible war. Certainly it was neither a lasting military nor a moral victory for Israel. In the grief and of disappointment, over the loss of life both of Israelis and of innocent Palestinians we need perspective. I find it here in Germany. Despite occasional Anti-Semitic expressions I see daily reminders of where we Jews were just decades ago, and how far we have come. Currently the Holstenschule in Neumünster has a beautiful exhibit based on the life of my wife’s 93-year old artist mother, Stefanie Steinberg. Her maiden name is Apt, and maybe the hope and joy with which she lives, despite what she endured, was taught to her forbears by the famous Rabbi Meir of Apt, whom I quote above. The Neumünster exhibit allows students a wonderful opportunity to learn of her remarkable life journey from Breslau to Spain, to Switzerland to New York to Los Angeles and eventually to San Francisco where she still lives independently and recently gave a marvelous talk to the San Francisco Women’s Artists in which she has been active for over half a century. The ingenious exhibit in Neumünster, designed by Lutheran Pastor Ursula Sieg educates students and members of the public who visit not just about the horrors of the Holocaust but about Jewish thought, history and practice as well. Just last week I spoke at the University of Potsdam to open the semester of the School of Jewish Theology and to rabbinical students at the Abraham Geiger College in Berlin. Both of these institutions offer their tutelage to our future professionals in Europe at government expense. As Jews we have many roles to play in this world. We are not just a beleaguered country that became a State in 1948. We are not just congregations—in North America and around the world– concerned for our fiscal and programmatic futures. And we are certainly not just those whose past is tied to the destruction of European Jewry during World War II. Although I have real concerns as I return to the city of my father’s birth and upbringing, I will certainly be aware that the Leipzig to which I return is very different than the Leipzig my father left. Buoyed by the reality of today, I will return to Leipzig to proclaim with the joy and hope Rabbi Meir of Apt recommends. 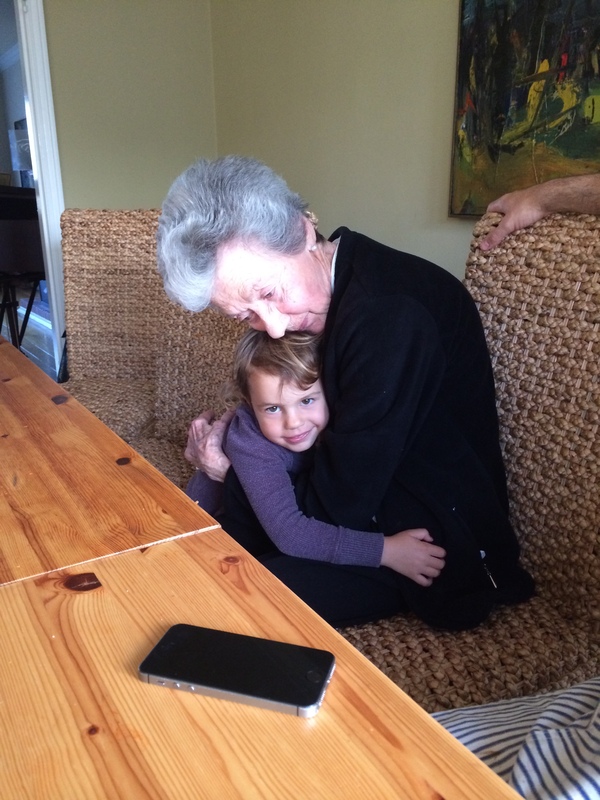 The irrepressible 93-year-old artist Stefanie Steinberg (Vickie’s mother) subject of the exhibition at the Holstenshcule in Neumünster, Germany, holding three-year-old great-grandaughter, Noa Lauren Moskowitz with whom she has a special bond.